Flexible paper-like colour computer displays that can show moving video are under development by the Dutch electronics giant Philips. Two scientists at the company's research facility in Eindhoven describe the latest step forward in e-paper technology in the journal Nature. Philips - and other firms like E Ink in the US - have already succeeded in making prototype flexible displays, but their refresh rates - the speed at which they can turn a single dot on or off - have been slow. 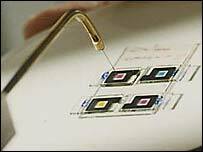 These previous prototypes have used a principle called electrophoresis to switch pixels on or off. But now the Philips team says its new technology can significantly improve the refresh rate using a faster effect called electrowetting. "Electrophoresis involves moving particles around in a liquid - applying a voltage and getting them to move," explained Robert Hayes, one of the pair of researchers who have published details of their work. "Electrowetting gets liquids to move around in other liquids. "Electrowetting devices are quick. 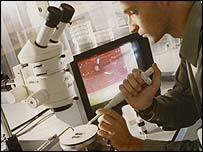 Electrophoresis is a slow effect," he told BBC News Online. The two technologies clearly lend themselves to different applications. The new electrowetting colour displays now in development will be able to display full colour moving video. The slower moving electrophoresis displays will be more suited for use in electronic books and display signs where the information on display is relatively static. Video displays in Europe conventionally display 25 frames per second to provide the viewer with a lifelike impression of motion. The electrowetting displays described by Dr Hayes and his colleague Johan Feenstra refresh within 12-13 milliseconds, fast enough to refresh 80 times a second. The task now is to get the technology off the lab bench, through prototyping and into production. "We're working with colleagues to develop fairly small prototypes. We're at the end of the research stage and starting to scale up. "We anticipate a one-inch (2.5 centimetres) diagonal working monochrome prototype by the end of the year. "Moving from monochrome to colour is no big problem," said Dr Hayes.